This is the largest recorded multiple of Scott 136 in existence. It is also the only example to show the entire imprint and plate number. A block of eight is known with the I Grill, but it only shows the plate number. Another block of eight shows only part of the imprint. 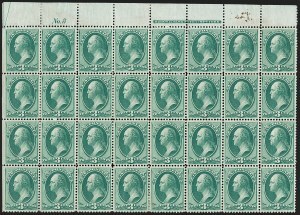 The imperforate bottom-margin block of 16 offered in the following lot has the complete imprint and plate number--from a different plate and with a different style of imprint--but it is not the regularly issued stamp. Considering the centering of the stamps in this block, the Mint N.H. gum, and the scarcity of choice singles of this issue, its survival as a multiple is miraculous. In fact, the miracle worker was Jack Chapin, whose passion for classic plate number blocks ensured that the vandals were kept at bay. John C. "Jack" Chapin served with the U.S. Marine Corps as a second lieutenant rifle platoon leader in the South Pacific, receiving two Purple Hearts for his valor. Long interested in military history--World War II in particular-- Chapin was the author of Uncommon Men: The Sergeants Major of the Marine Corps and numerous monographs for the Marine Corps Historical Center. Chapin was also a collector of classic plate number multiples. In 1982 he published a census of all classic plate number blocks known to him, and he updated the census with articles in the Collectors Club Philatelist. After Mr. Gross acquired the entire Chapin collection in 2002, he of course kept this block intact. When it is sold in the Gross auction, we hope a true philatelist will acquire and preserve it, as Jack Chapin did 45 years ago and Mr. Gross did for the past 17 years. Only two multiples of the 3¢ Bank Note grilled issue are known showing the complete imprint and plate number. 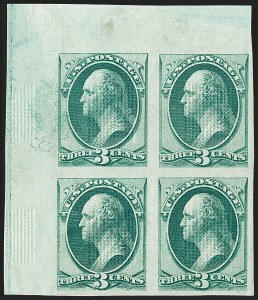 The other, offered in the previous lot, is the normal perforated Scott 136, from the top position, from a different plate and with a different style of imprint. The example offered here has a line added at the top of the imprint--"ENGRAVED & PRINTED BY THE"--and has a hyphen added between "BANK" and "NOTE." This block has an interesting history. The first owner of record was William H. Crocker. The Crocker family built an empire in the west, which included railroads, banks, insurance and other enterprises. William H. Crocker, president of Crocker National Bank in San Francisco, began collecting U.S. and foreign stamps in 1884 and, by the start of the 20th century, had already assembled a world-class holding. Through acquisitions from the collections formed by Craig, Castle, de Coppet, Ayer, and Worthington, Crocker's collection evolved into what is today still considered one of the greatest worldwide collections ever formed. He died in September 1937. Arrangements were made to sell Crocker's 42-volume collection at auction through Harmer, Rooke & Co., a London-based firm run by Gordon Harmer. An unexpected outcome of the Crocker sale is a discovery of a mint block of four of the 12¢ Dull Violet of the United States grilled series of 1870-71. At the London auction this was described as comprising the non-grilled 12¢ issued in the same year, its catalogue quotation being given as $500. Examination of the block after its arrival in New York disclosed the presence of two vertical rows of grills on three of the stamps and almost a full grill on the fourth, and this established the block as #140 with a catalogue value of $10,000. Its sale price in London was $800. The block was bought at the Crocker sale by famed dealer Y. Souren. Souren escaped Georgia just ahead of the Bolshevik army, posing as a peasant driving a hay cart. Under the hay was his valuable collection of medieval and primitive clocks and timepieces, which he sold to the Metropolitan Museum of Art. 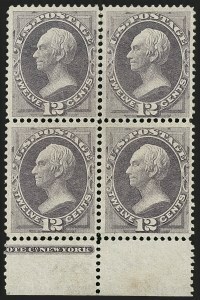 Souren is also famous for buying the unique block of four of the 24¢ 1869 Pictorial Issue invert at the same 1938 auction of the Crocker collection where the block offered here was acquired.